Bank in Flames Painting Scares LAPD. 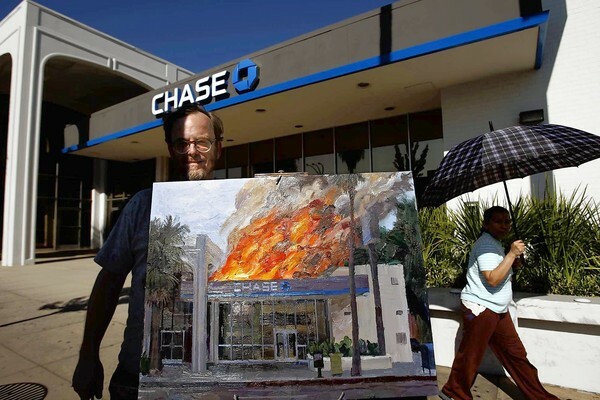 The LA Times has an interesting story about an artist, Alex Schaefer, who had set up his easel on the corner of Sylvan and Van Nuys Blvd., in front of Chase Bank, and was creating a painting of the bank in flames. The cops questioned him and the next day, detectives showed up at his home to interview him and ask if he intended to torch his subject matter. I am reminded of an incident that happened to me several years ago in this same area. In 2007, I had walked around the corner from this area, and was shooting daylight images of the historic 1933 Valley Municipal Building. As I was doing this, a woman came out of the building screaming, “He’s taking photos! He’s taking photos!” She later drove her car down the street and followed me as I walked westward down Sylvan St. and then she stopped and demanded to know what I was doing. I told her I was a photographer. Painting and photography are two acts that may get you in trouble with the law. That’s America in the 21st Century. What a nation of sheep. When people get back in touch with Common Sense then people like this nut-job woman that followed you down the street will be looked upon as what she truly is, a nut-job. As for the cops, I would have thrown them off my property and told them not to come back unless they had an arrest warrant. Know and stand up for your rights! After all, this is STILL America, the land of the FREE. Couldn’t agree with you more. Thank you for your comment. ← Lake Balboa is still “Van Nuys” to US Postal Service.